One of the basic human needs is the need to belong. 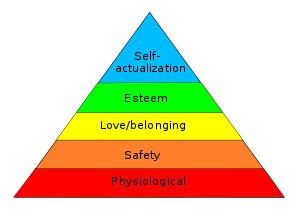 In Maslow’s hierarchy of needs, after the essentials like food, water and safety, the need to belong and feel loved are the next important. After our need to belong, self-esteem and self-actualization are following in order. We just cannot be our authentic selves without belonging to something that is bigger than the tiny piece of the world that we live in. We indeed are nothing without some kind of tribe, clan or some semblance of family. What even is a family? In the past, I have really struggled with what it means to be in a family. I always assumed that you needed parents, kids, cousins, aunts, uncles and grandparents. My understanding of family is that we all had to rally around the family crest, our name and our shared values. But what if I can’t have a family with all of those stereotypical players. What if my parents are no longer in the picture? Who do I belong to? I’ll be honest, I never quite fit into the traditional family ideal. To place people of the same last name, DNA and common ancestors above everyone and everything else in my life just never set in with me. I felt guilty about feeling this way. It always came down to changing who I am to match who belongs inside of my tribe and every time I just wasn’t willing to do it. Was I just not ready to conform to my tribe or was I trying to submit to the wrong tribe? Nearly three years ago I joined a local gym called 3rd Degree Training. After witnessing some impressive transformations made by some close friends, I decided that I would give it a try. At first, I was very reserved about doing this. At the time I was a very introverted person filled with past pain and trust issues. To workout and possibly make a fool of myself in front of people who were much more fit than me, scared me to the bone. On top of it all, I might have to talk to people! While I made the excuse that 6 AM workouts were the best for my schedule, the reality was, I figured these would be the least populated classes and I could sneak in and then out, not having to deal with people. I wasn’t even there two months before I noticed a change within me. As my abilities to the different workouts grew, my confidence within me began to grow right alongside them. Soon, I was talking to more people, and I was making friends outside of my trusted circle. I felt comfortable to be a new me. After six months I was seeking conversations with new members of the gym and even outside of the gym. Don’t get me wrong, I wasn’t a social butterfly by any stretch, but I at least wasn’t avoiding people. A year and a half after joining 3rd Degree, I was asked if I wanted to work as a trainer. This would mean I would have to shatter any social anxiety and workout directly in front of everyone. This was the point at which my awkward and introverted self would have to open up and become bigger than how I was playing. It was at this point I realized, my family was changing me. I could write an entire blog post on how many times my 3rd Degree Training family had lifted my spirits when I was low. There were so many times that I felt alone and weak only to be lifted up by those who I workout with. And whenever I needed support, they were there willing and ready. It was never so evident of the support that I have from my workout family when I recently hosted a Victor Walk in my hometown. It was a sunny summer Saturday morning and out they came, dressed in orange and ready to walk 5 km (many joined after a workout earlier that morning) alongside me in support of a cause significant to me. Of the forty amazing people that came out for the Victor Walk, at least 25 of them were from my 3rd Degree family. I realized that morning that I really had something special, I belonged, and I was changing for the good because of the family that I had found and helped build. What even is a family? It is the people who share a common bond whose sole purpose is to make everyone within it a better person. There are no defined set of rules or default relationships, a family is all inclusionary and are those who support you for you. Your family is a reflection of who you are and not the other way around. In Maslow’s hierarchy of needs, your self-esteem is dependant on the love you receive and the sense of belonging that you have with your family. If you are not hungry, are safe, but you lack proper self-esteem, then it only makes sense to work on the family that you surround yourself with. It is not uncommon to have more than one family, I have more than one family. Redefine what your family means and ditch the traditional DNA sharing and crest waiving stereotypical family lifestyle if it is not allowing you to be yourself. Find the tribe, clan or family you really belong to and receive the kind of love that you deservedly need. We use some words without ever giving them a second thought. But some words, they can have a lasting effect on our psyche. Here are 7 words you should remove from your vocabulary if you want to be happy. If we are looking to followers to be a great leader, then you will never find them. Leaders do not need followers to lead, they create leaders.